Paris, France – The European Commission, policymakers, and organisations from 28 countries meet at the French Ministry of Health in Paris to launch the European Joint Action on Antimicrobial Resistance and HealthCare-Associated Infections (EU-JAMRAI), coordinated by France (French National Institute of Health and Medical Research, Inserm, with the support of the French Ministry of Health). 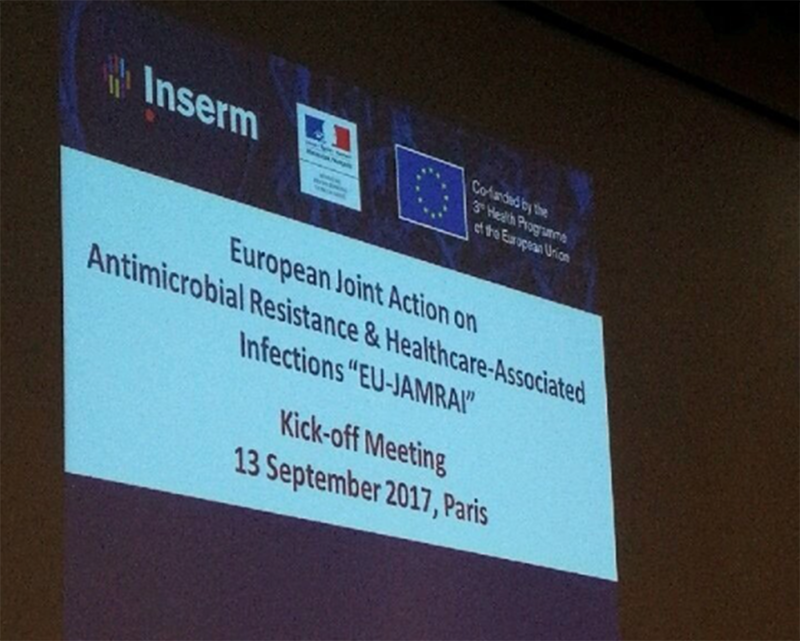 The Joint Action, EU-JAMRAI, aims to bring together the participating EU member states and international organisations, institutes, universities to contribute to tackle Antimicrobial Resistance (AMR) and Healthcare-Associated Infections (HCAI). It will capitalise on existing initiatives and propose concrete steps to reduce the burden of AMR. AMR is a major public health problem that will cause 10 million deaths worldwide by 2050 unless action is taken. EU-JAMRAI is an EU-funded project that will contribute to face this problem, already responsible for an estimated 25,000 deaths per year in the European Union. This collaboration strives to foster behavioural change at individual and community level and tackle this pressing issue within a “One Health” approach, considering the prevention and control of AMR in humans, animals and environment. Given the many international and European initiatives on AMR such as WHO Global Action plan, the recently adopted EU action plan, the JPI AMR or the Council Conclusions on AMR, EU-JAMRAI aims to ensure that policies for control of AMR and healthcare-associated infections are adopted and implemented across EU Member States in a coordinated way. No less than 44 partners and 38 collaborating stakeholders from all over Europe participate in this JA. Key international organizations such as WHO Europe, OECD, OIE and FAO will take part in this project to fuel the debate with their expertise and ensure consistency with existing initiatives. Additionally, representatives from health professionals, patients and industry will take part in EU-JAMRAI. EU-JAMRAI is funded by the participating partners and the Health Program of the European Union with total budget of €6,963,604, with €4,178,162 from the EC. The International Federation of Medical Students’ Associations (IFMSA) taking an active role against Antimicrobial Resistance. IFMSA believes that the recent and continuing increase in antimicrobial resistance is one of the greatest challenges to global health today. IFMSA recognises the importance of controlling antimicrobial resistance to protect public health and reduce the associated premature mortality and morbidity as possible and commits to improve professional education, trainings and strengthen international collaboration. IFMSA, represented by the Liaison Officer to Student Organisations, Batool Alwahdani, is Joining the European Commission, policymakers, and organisations from 28 countries at the French Ministry of Health in Paris to launch the European Joint Action on Antimicrobial Resistance and HealthCare-Associated Infections (EU-JAMRAI). Antimicrobial Resistance is one of the core focus areas that IFMSA works on, and it is a primary priority for IFMSA’s European Region. In February, IFMSA organized a panel discussion on AMR at YO!Fest with the European Commission, the European Pharmaceutical Students’ Association and the International Veterinary Students’ Association. The panel discussed youth engagement and inclusion in fighting against Antimicrobial Resistance, the One Health Approach and the need for collaboration in acting against antimicrobial resistance. IFMSA is also one of the civil society organizations to have given input to the European Commission on One Health Action Plan on Antimicrobial Resistance. In addition, IFMSA participated in the WHO expert consultation meeting on health workforce education and antimicrobial resistance control in March this year, and continues to be committed to the process of achieving the goals of the WHO Global Action Plan on Antimicrobial Resistance. IFMSA has 136 National Member Organizations from 127 countries, and encourages them to organize national campaigns on Antimicrobial Resistance. Throughout the Antimicrobial Resistance Awareness week, held in November (15-21), IFMSA equipped its members with the tools and resources to create awareness campaigns and advocacy actions against Antimicrobial Resistance. IFMSA members adopted a policy document about Antimicrobial Resistance during IFMSA August General Assembly 2017 in Arusha Tanzania, and the European members of IFMSA adopted a European regional policy paper on antimicrobial resistance during the IFMSA March General Assembly 2017 in Budva, Montenegro. IFMSA believes that educating healthcare providers on appropriate antimicrobial use is key in reducing resistance, and IFMSA has been taking an active role in promoting awareness about antimicrobial resistance in Europe and the world.